Or the liabilities of the business may have decreased ,i.e more cash has been spent this year in paying off suppliers than was the case last year. 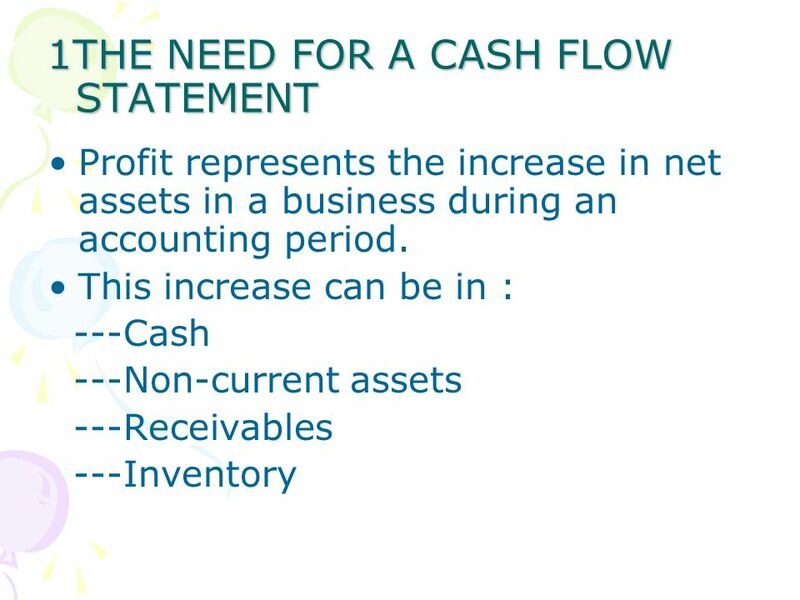 A cash flow statement is needed because of the differences between profits and cash. It achieves the following: ---Provides additional information on business activities ---Helps to assess the current liquidity of the business. 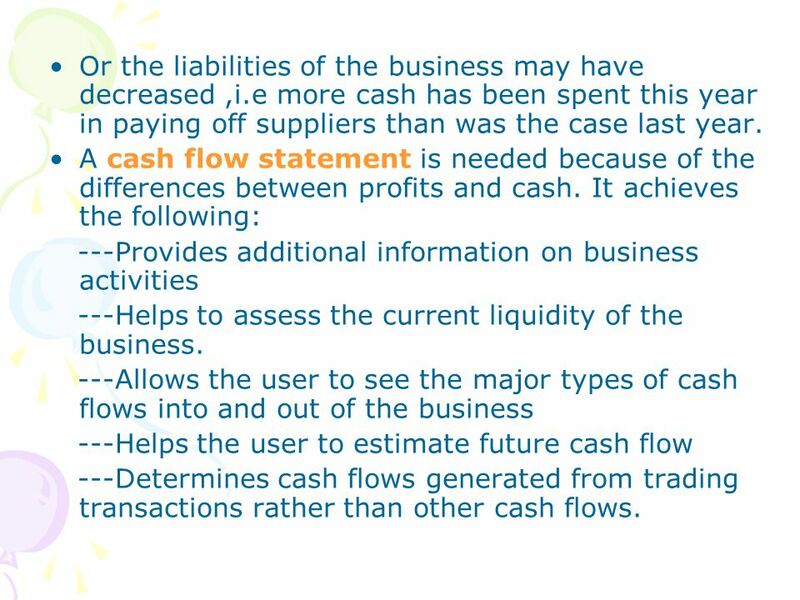 ---Allows the user to see the major types of cash flows into and out of the business ---Helps the user to estimate future cash flow ---Determines cash flows generated from trading transactions rather than other cash flows. 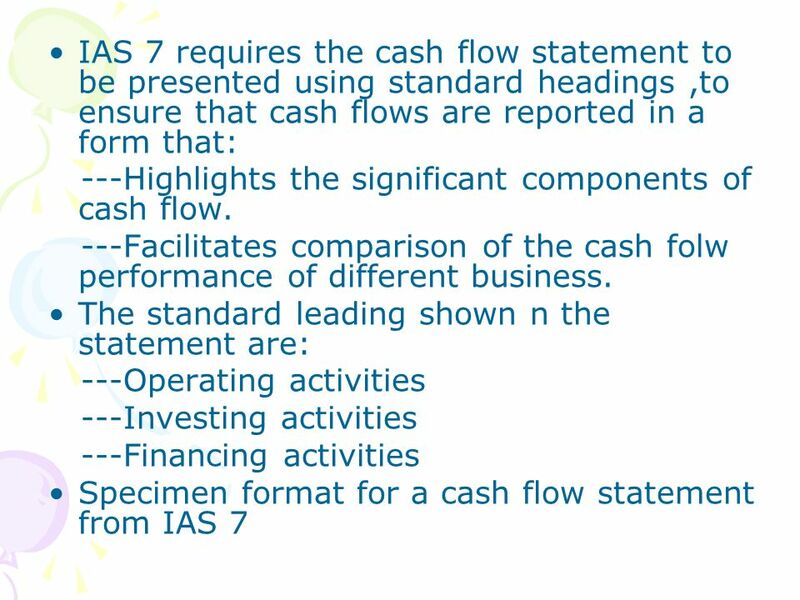 IAS 7 requires enterprises to present a cash flow statement as part of their financial statements. 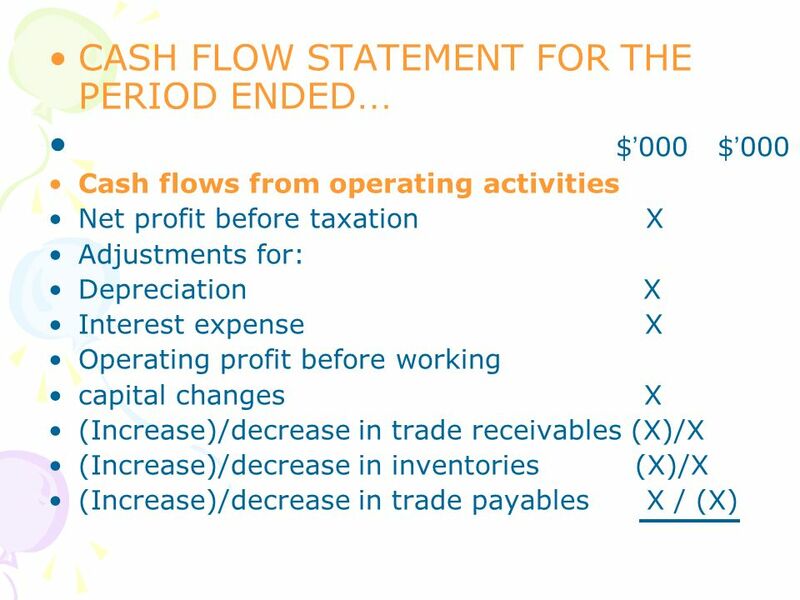 A cash flow statement can be presented in a number of ways: ---As a summary of the cash receipts and payments of an enterprise (a summarized cash book) ---From the balance sheet and income statement, opening with a reconciliation between reported profit and operating cash flow. 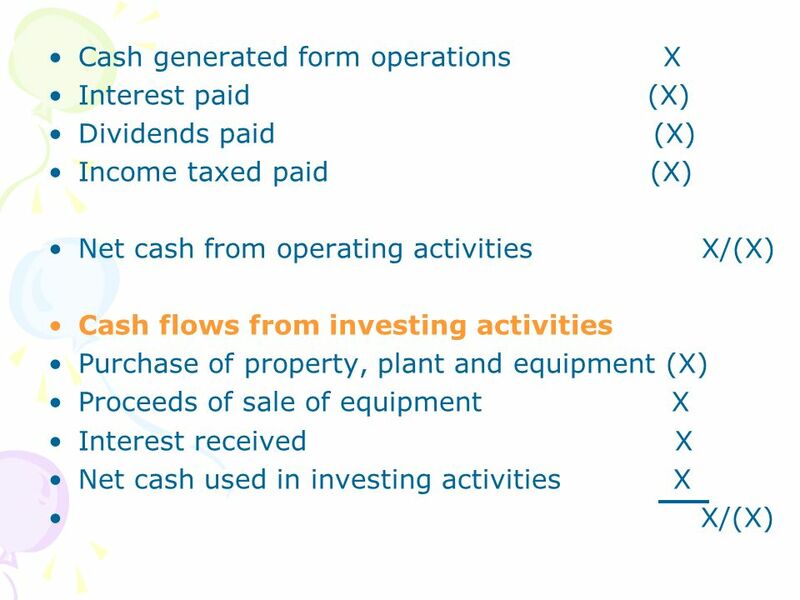 11 Cash flows from investing activities :cash spent on non-current assets, proceeds of sale of non-current assets and income from investments. 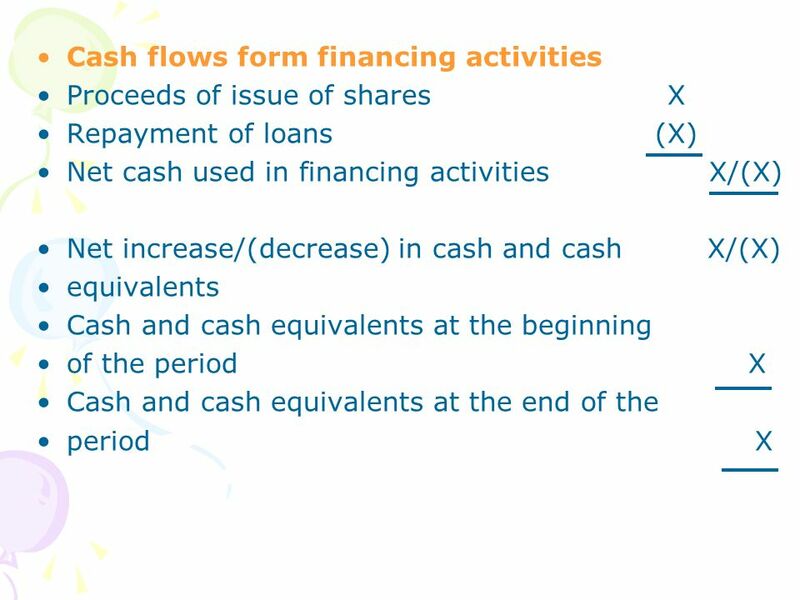 Cash flows from financial activities: the proceeds of issue of shares and long-term borrowing made or repaid. 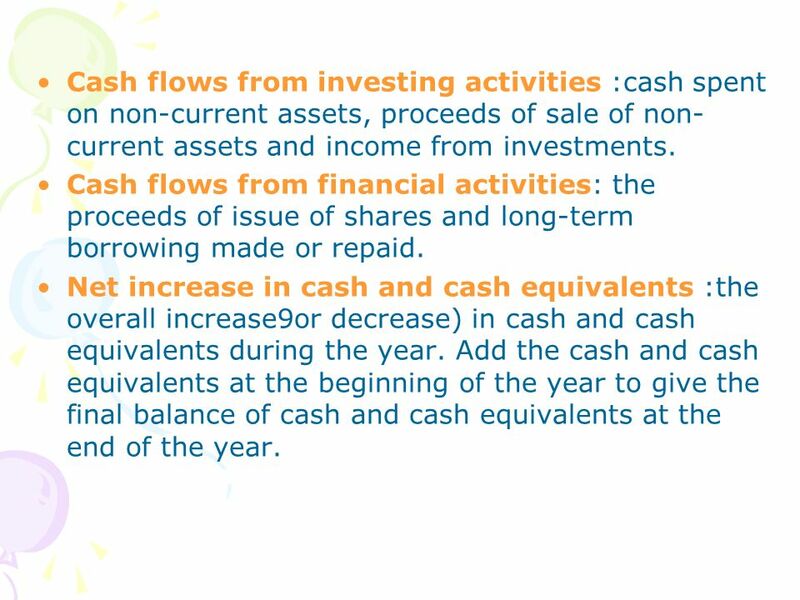 Net increase in cash and cash equivalents :the overall increase9or decrease) in cash and cash equivalents during the year. 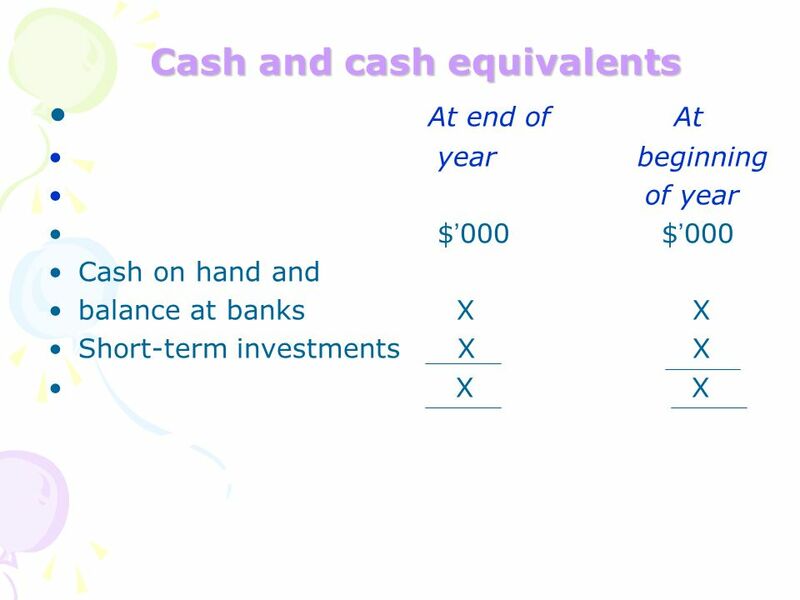 Add the cash and cash equivalents at the beginning of the year to give the final balance of cash and cash equivalents at the end of the year. 12 ---‘cash’：cash on hand and deposits available on demand. 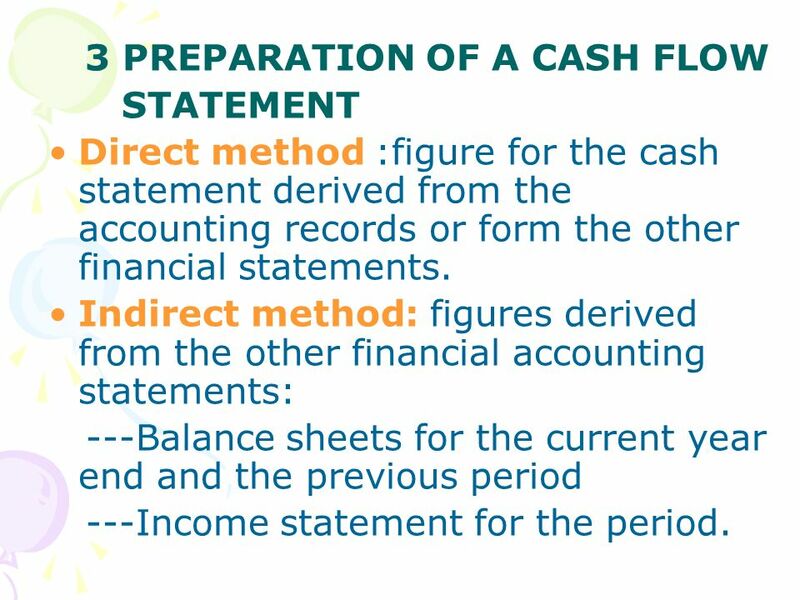 STATEMENT Direct method :figure for the cash statement derived from the accounting records or form the other financial statements. 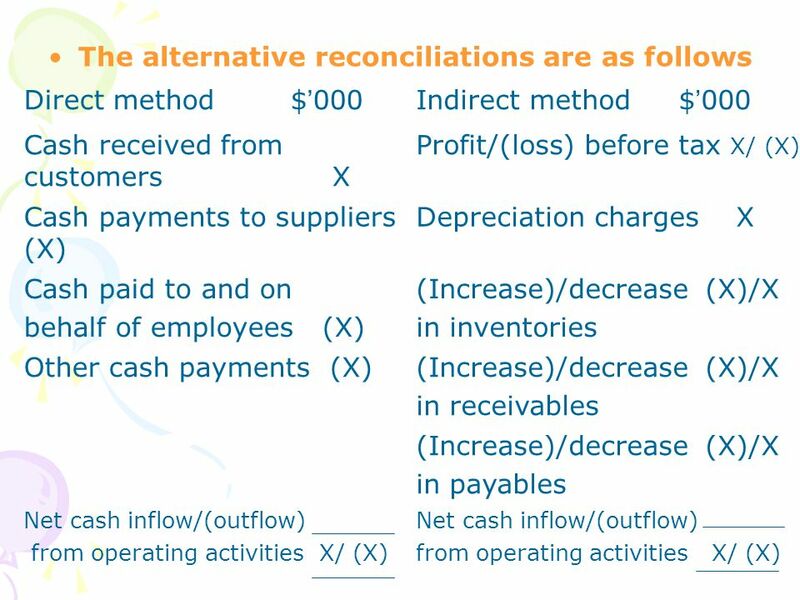 Indirect method: figures derived from the other financial accounting statements: ---Balance sheets for the current year end and the previous period ---Income statement for the period. Indirect method ---You are usually presented with two balance sheets: for the end of the prior period and for the end of the current period. 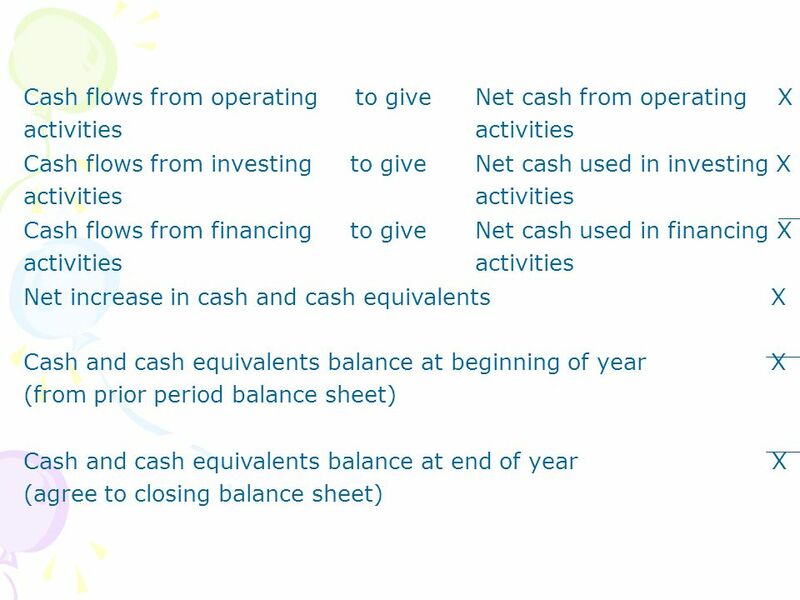 All the differences between the opening and closing balances are various types of cash flow, or are otherwise needed to produce the cash flow statement. 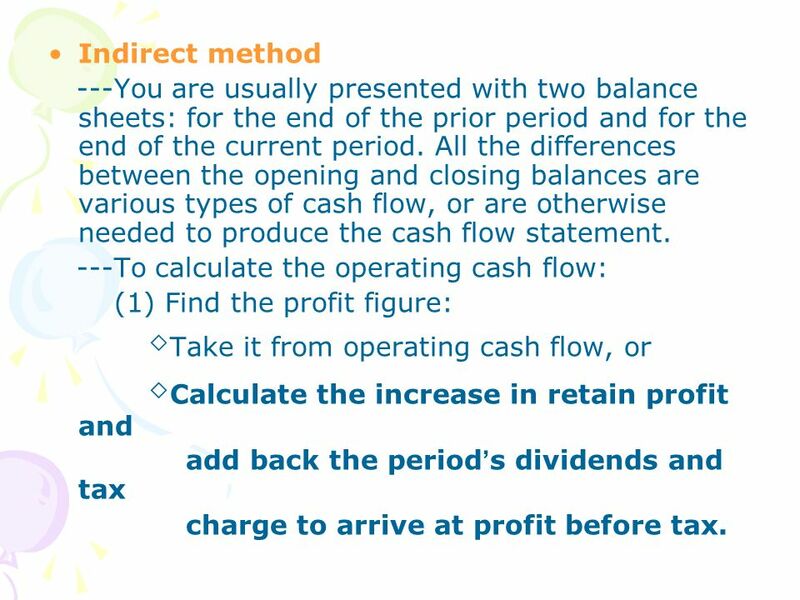 ---To calculate the operating cash flow: (1) Find the profit figure: ◇Take it from operating cash flow, or ◇Calculate the increase in retain profit and add back the period’s dividends and tax charge to arrive at profit before tax. 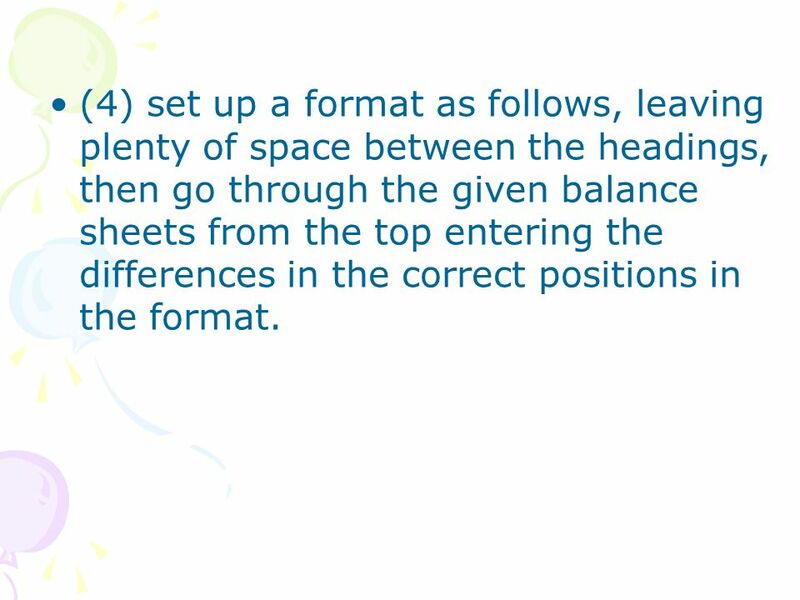 18 (4) set up a format as follows, leaving plenty of space between the headings, then go through the given balance sheets from the top entering the differences in the correct positions in the format. 23 Whether you use the direct or the indirect method, here are the steps you should take in the exam. 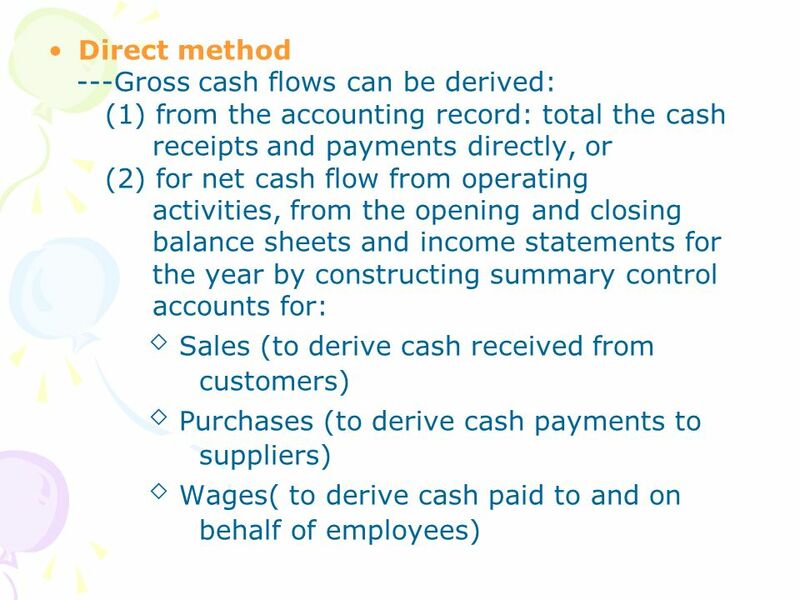 Allocate one or two pages to the cash flow statements so that easily identifiable cash flows can be inserted. Allocated a father page to workings. 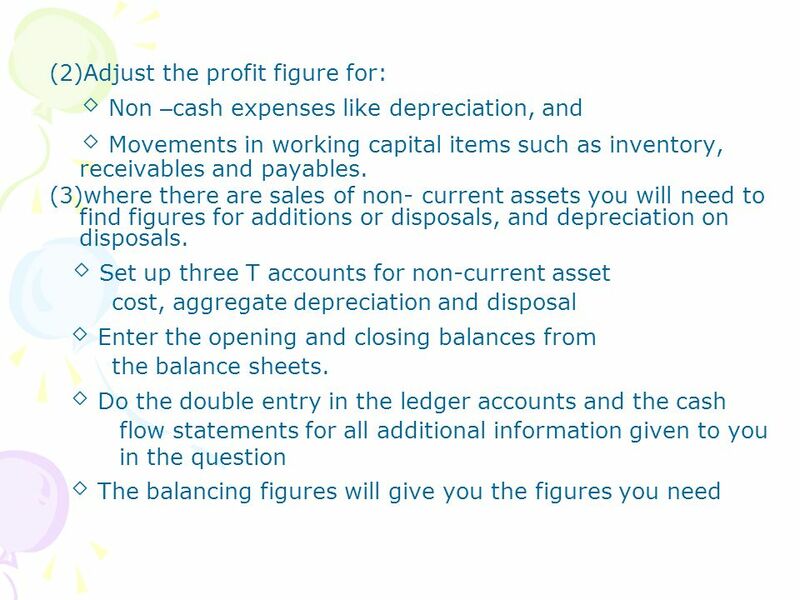 Step 2 Go through the balance sheets and take the balance sheet movements to the cash flow statement or to workings as appropriate, Tick off the information in the balance sheets once it has been used. 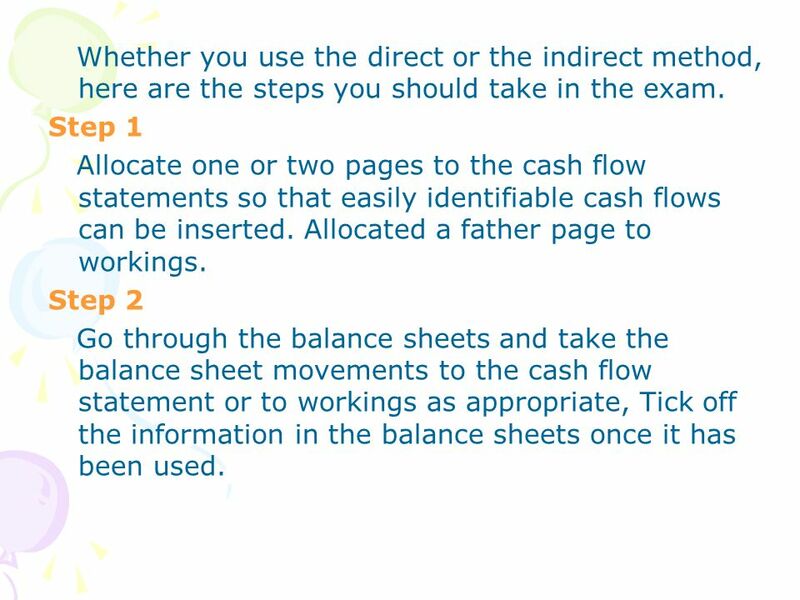 24 Step 3 Go through the additional information provided and deal with as per Step2 Step 4 The amounts transferred to working can now be reconciled so that the remaining cash flows can be inserted on the statements. 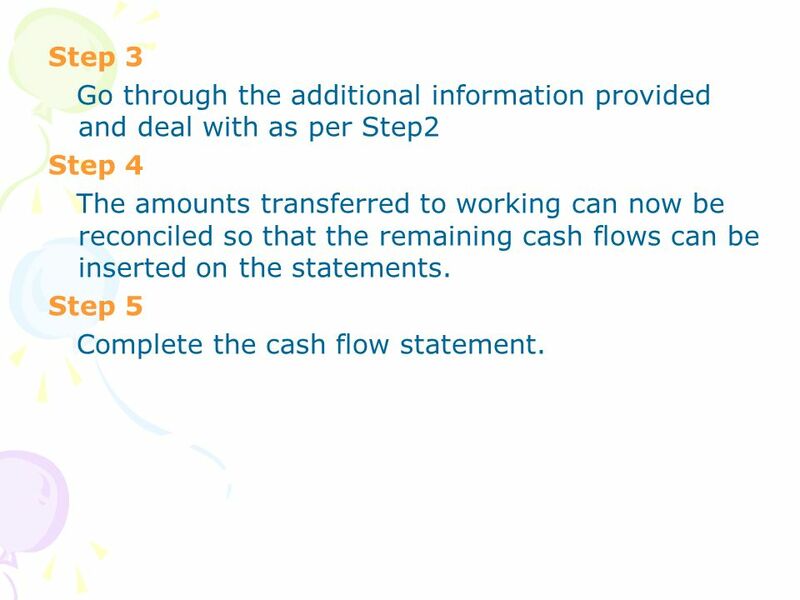 Step 5 Complete the cash flow statement. ---How the enterprise generates and uses cash and cash equivalents. 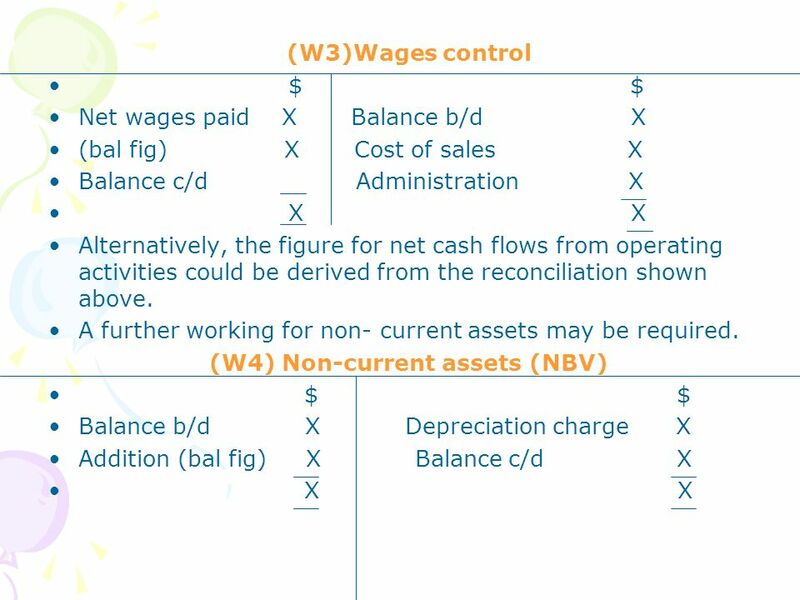 ---Changes in net assets, financial structure (including liquidity and solvency) and the ability of the enterprise to adapt to changing circumstances. 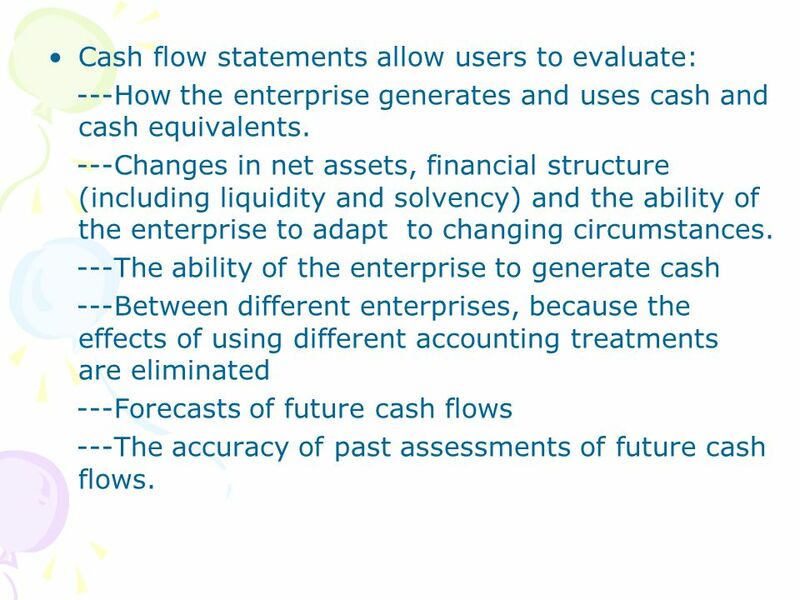 ---The ability of the enterprise to generate cash ---Between different enterprises, because the effects of using different accounting treatments are eliminated ---Forecasts of future cash flows ---The accuracy of past assessments of future cash flows. 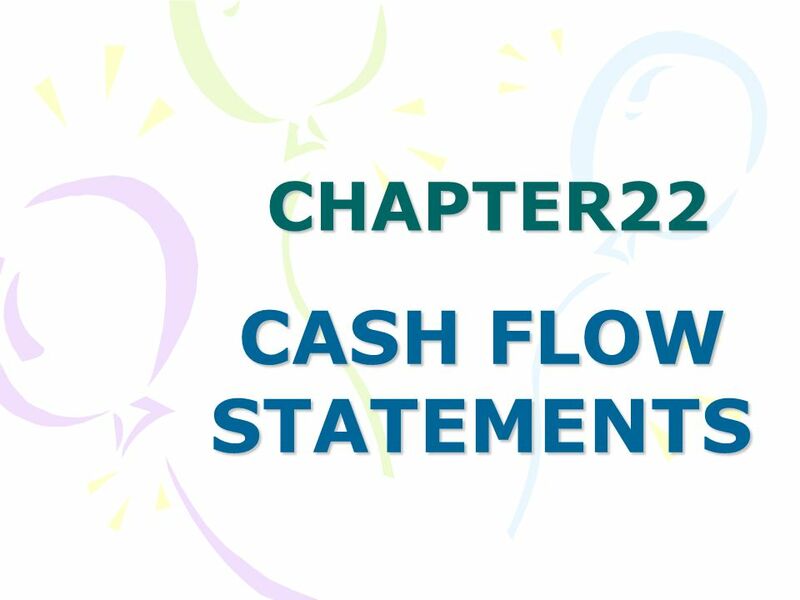 Download ppt "CHAPTER22 CASH FLOW STATEMENTS." 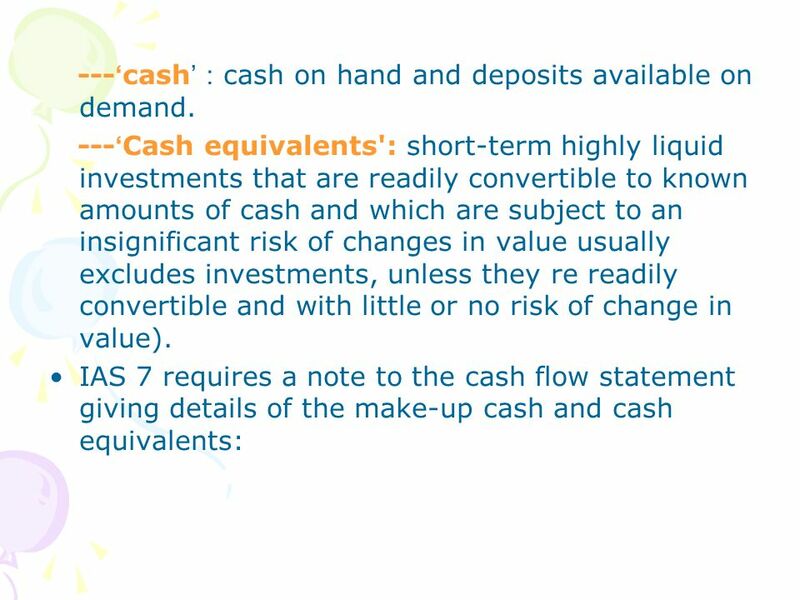 1 © Copyright Doug Hillman 2000 Statement of Cash Flows. Copyright © 2008 by The McGraw-Hill Companies, Inc. All rights reserved. 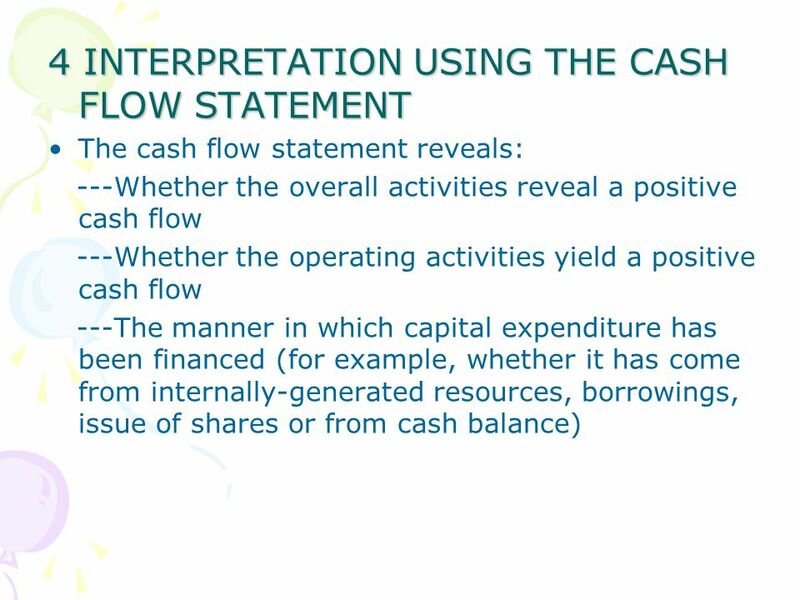 McGraw-Hill/Irwin Chapter 12 Reporting and Interpreting the Statement of Cash. Copyright © 2007 by The McGraw-Hill Companies, Inc. All rights reserved. 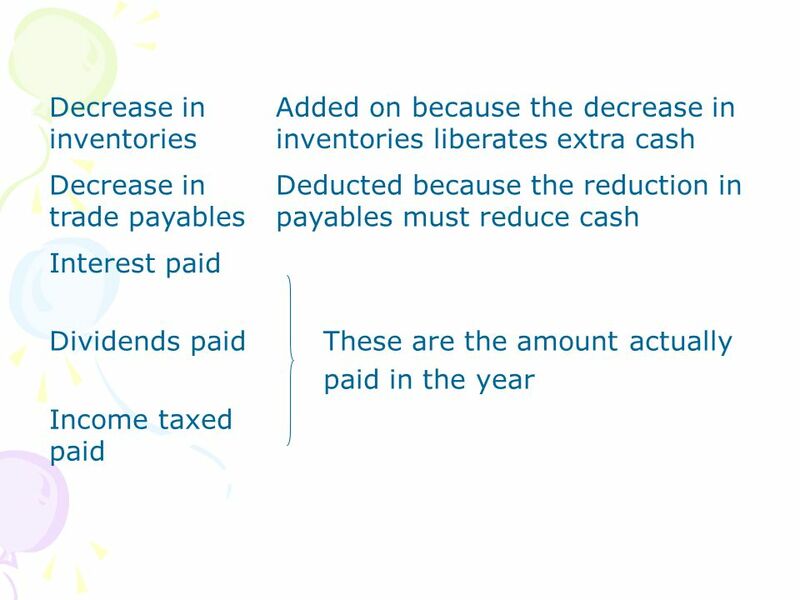 Statement of Cash Flows Revisited 21. Copyright 2003 Prentice Hall Publishing Company1 Chapter 10 Preparing a Statement of Cash Flows. 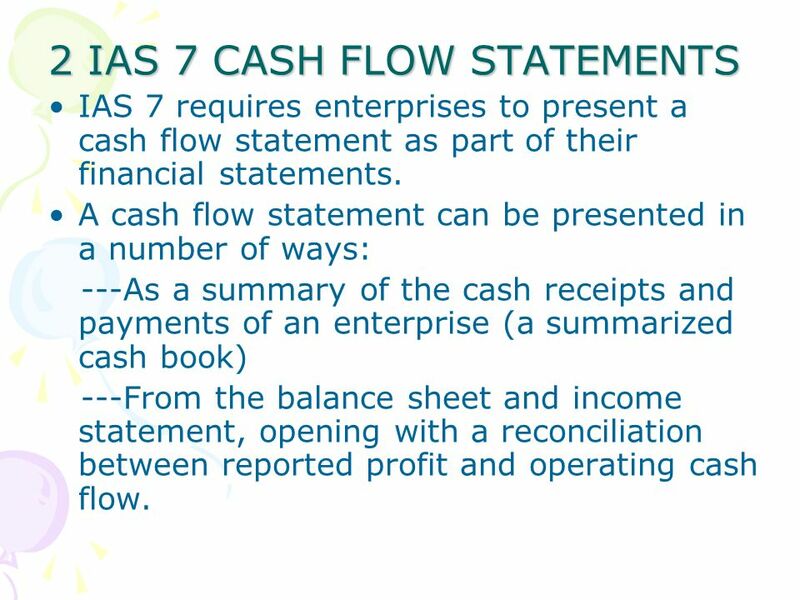 12-1 STATEMENT OF CASH FLOWS Financial Accounting, Sixth Edition 12. McGraw-Hill /Irwin© 2009 The McGraw-Hill Companies, Inc. 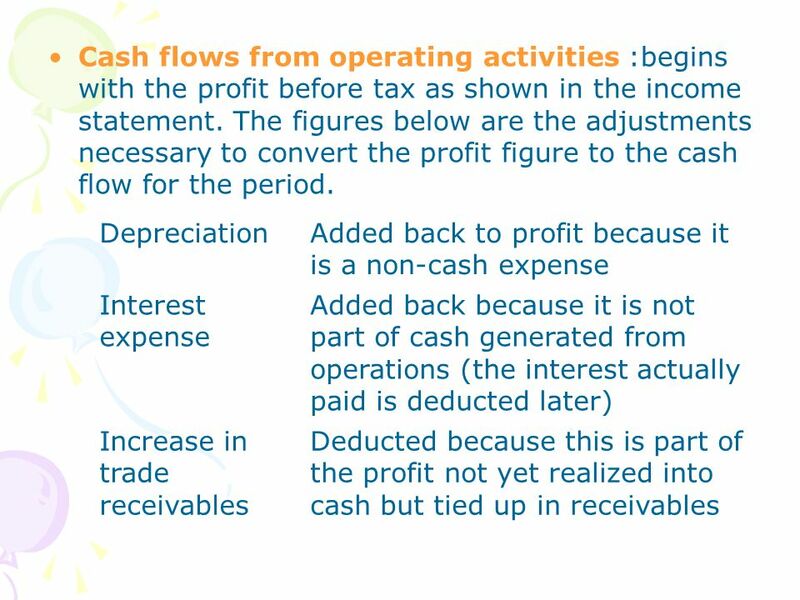 THE STATEMENT OF CASH FLOWS REVISITED Chapter 21. 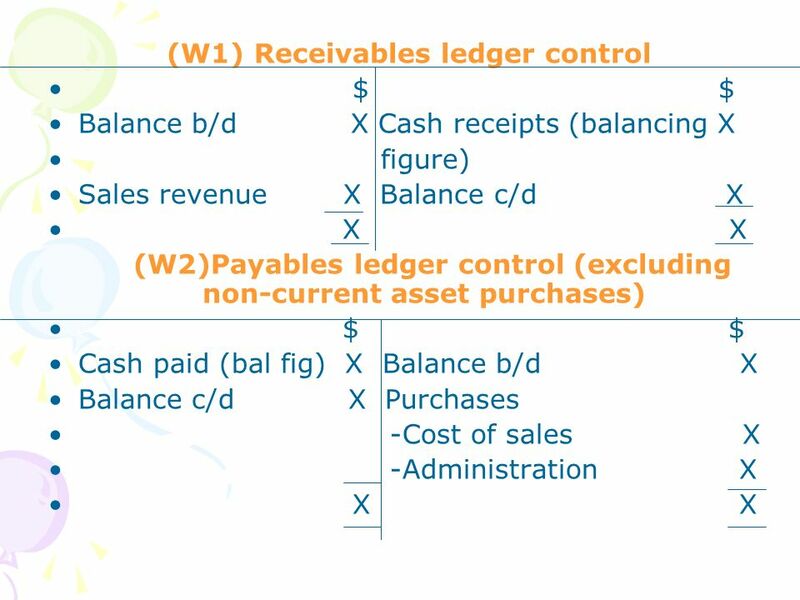 13-1 Preview of Chapter 13 Financial and Managerial Accounting Weygandt Kimmel Kieso.